Stroll along the lake shore or have tea and a snack at the Chateau! For those who are more ambitious, a hike to the Teahouse or a paddle around the lake are also possibilities. The time of year you are there will determine the colour of this glacier-fed lake! The lake hits 4°C (39°F) in August (the warmest month) - so don't expect to go swimming!! This short up-hill hike is really worth the view!! Do it and be rewarded with your own picture-postcard! Beware of summer crowds: arrive before 10 am or after 5 pm or go with the private shuttle service which operates out of the village. The road to Moraine Lake closes from early October to late May. There is nothing like skating on the Lake with the backdrop of Mt Victoria. Don't worry about bringing your skates - you can rent them on site. The atmosphere is terrific and if you go in February, you can even catch the international ice sculpting competition! This is a great choice especially if you need to warm up but don't want forgo the mountain experience. Here you can learn about the animals, geology and history of the Canadian Rockies. Click here for a detailed map of the area. 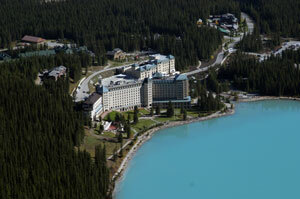 Lake Louise has got to be the most sought-after spot in the Rockies. Most can't believe the colour of this stunning lake until they have seen it for themselves. "Years ago, when I was young, my father brought me here to see the most beautiful and peaceful lake he had ever seen. Now that I am old and will not be able to travel much longer, I decided that I just had to make my last trip here to see that very sight again. Today I saw that icy-blue emerald colour once more with the reflection of the glacier. The sight was just as inspiring as the first time I saw it all those years ago." That is the kind of impression this lake leaves. The first time I heard this type of story, it changed the way I thought about my job. It became more than just a job. I realized that bringing people to Lake Louise meant something different to each person on my tour and you just never know what each particular person is looking for on a vacation. I am often asked what gives the crystal clear mountain lakes of the Rockies their beautiful aqua colour. The colour you are looking at is a result of rock flour which is suspended in the water. As glaciers "flow", rock is ground into powder and since these lakes are glacier-fed, these tiny particles of rock can be found in the melt waters. 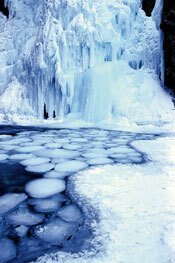 In the spring, when the melt waters are at their highest levels and the water appears "milky" with rock flour. In late summer the water appears more emerald green, reflecting the rich colour of the rock flour. By the way, the mountain that reflects onto Lake Louise is Mt Victoria, named fittingly after her mother. Located just 55 km (34 mi) from Banff is the Village of Lake Louise; a cozy little spot created as a result of the visitors the lake draws. "The Village", as it is called by the locals, is charming yet simple and caters to the needs of its visitors with restaurants, gas stations (which are few and far between in the park), spas and of course accommodations ranging from hostels, campgrounds, hotels, inns and chalets. Because it is located within Banff National Park, only those employed in the park or for the park are allowed to live within its boundaries. 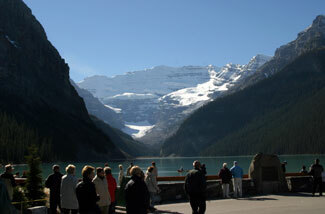 Many decide to stay directly on the shores of the Lake at the famous Famous Chateau Lake Louise. This hotel began as a small log cabin built in 1890 by the Canadian Pacific Railway in the hopes that adventurers would enjoy the setting. Today the sister hotel to the Fairmont Banff Springs is luxury at its finest with great dining and a stunning spa to make your stay memorable. Can't afford to stay at the Chateau? Don't worry. There are many other possibilities not far from the Lake and in the Village. Today this place is a favourite among tourists and they come here for a lot more than just the lake itself. Outdoor activities like canoeing, horseback riding and hiking are popular in the summer months - but let's not forget sports like skiing, snowboarding and ice climbing that make the winter months many people's favourite time of year to visit. The breathtaking scenery make all of these activities even more relaxing and enjoyable. Take in the rich colours of the wildflowers, forests and lakes in the summer and the cool palettes of the glaciers, iced-over waterfalls and sugar-dusted evergreens in the winter. When you arrive you may notice the high elevation (the Village at 1540 m [5052 ft]) and the Lake at 1731 m [5680 ft]) and experience shortness of breath or tiredness. Please don't over do it and give your body the time it needs to adjust to the thinner air, especially if you are not accustomed to high elevations.